Box the life right out of me. That’s a line from the 8th episode of Torchwood. The team has to go through the belongings of a dead colleague. This came to mind this week as my husband and I got ready for new carpet. Everything had to come off the floor. The closets wouldn’t work as everything on the closet floors had to go up too. We filled the bathroom with shelves and loaded the shelves. On the patio we pushed our trunk, our dresser on top of that and our son’s dresser on top of that. More shelves. Stools. Lamp. Boxes and boxes of books. Chair, desk and sofa on its side in the kitchen. The main table and our bed outside. Then it all had to go back. You can spend years writing a book. Find an agent. Get published. Be acclaimed! And your book is still going to end up with dust bits clinging to the top of the pages and pushed into a box. Books I love go on shelves where I can see them (instead of the out-of-the-way bottom corner shelf). Maybe that is the best you should hope for. A book that someone takes out of the box when they move and puts on the shelf everyone will see. No respect for you, missy. None at all. Yeah, okay, that and two bucks will buy you a cuppa. But I can think of a lot of lower aspirations. We’re here. We gotta do something, right? Well, the picture here is from a few years ago when we moved from an upstairs apartment to a downstairs apartment, but I confess to never moving anything in black plastic trash bags. Since the husband sells wine for a living, we move in wine boxes–just so the neighbors can think we are lushes. When I relied on my dad for boxes, he worked at a hospital. I got to move in boxes that said things like bed pans on the side. That made a great impression when I moved into the college dorm. Some great readers don’t even keep books anywhere but their own heads. That would certainly do. Now I’ll get myself a cuppa and go do something–cause that is what I gotta do. 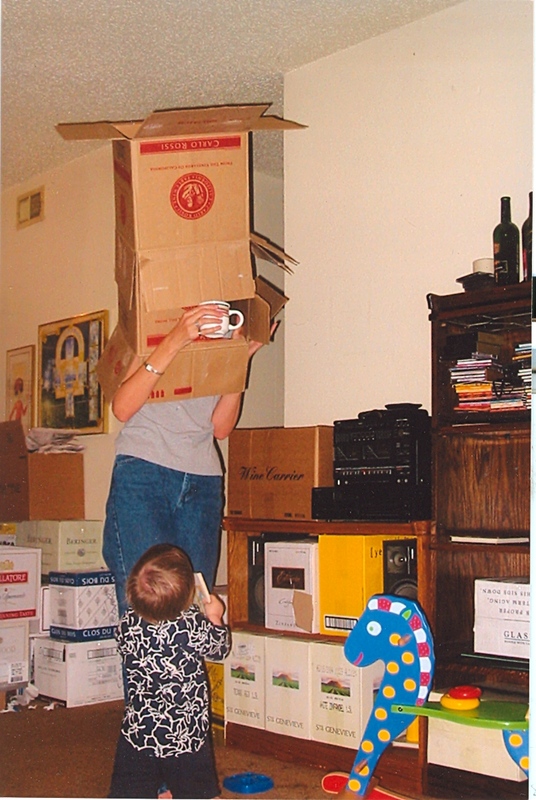 When I moved down to this area from Virginia, I got help packing from my brother and The Missus-to-be. They thought the way I packed was hilarious; they called it “boxes inside boxes” packing. Basically, if you save all the original boxes which things came in, you almost never have to pack anything non-rectangular. After the move, it drove me mad to open boxes they’d packed. Well-cushioned, nothing broken, all that — but they were basically just box-sized and -shaped piles. Heh. But where do you keep all those boxes? If I have only one skill in life, it is packing. I get the most out of every box. This time, however, I let the kiddo help. But it all worked out in the end. And your welcome on the shelving question. Anytime. That’s why I’m here! That sounds pretty wise and reasonable. Hoping to touch the lives of individual readers for a few hours at a time, while they read your story, is fine. I think hoping to leave something of permanence behind in your wake is probably a motive too. But in the end, we will all end up stored on a shelf somewhere collecting dust. If I have one hope, it’s that I can bring some enjoyment to anyone who picks the book up anytime from those dusty shelves or removes them from battered cardboard boxes and let them escape their world into mine for bit. Share my imagination with them so they can just follow along. Some people never keep books anywhere but in their own head. But I’d settle for a few hours of attention if I can’t have a lifetime of memory! Ah. Money. Don’t like to think about it. I think ending up on the shelf is a lot better than ending up in the trash! If you think about it, books belong on shelves – shelves were even named after books! But the worst place for a book is the garbage – so bad that not only will you never read it again, but you won’t pass it along to your friends – or even enemies – either. Shelf beats trash any day. I’m just odd enough to insist that certain books have to go on certain shelves. These are books I love and I want to know where they are at all times!! Have you ever read The City of Dreaming Books? There is some serious book love there.